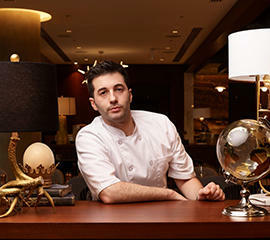 Chef Valerio Pescetelli serves as Executive Chef for The Victor at Parq Vancouver, an international hospitality, culinary, and gaming destination in the heart of Vancouver’s downtown entertainment district. With an award-winning resume and an entrepreneurial spirit, Chef Pescetelli was responsible for steering The Victor – Parq Vancouver’s premeir steak and seafood restaurant – and its team through the final stages of development as well as the restauarant’s opening in December 2017. Chef Pescetelli joined Blau + Associates following a successful tenure as Executive Chef of Frankie’s Italian Kitchen & Bar – the winner of 2017’s Diner Choice Award and Golden Plate Award. Prior to Frankie’s, he served as Sous Chef for Canucks Sports and Entertainment (CSE) in Vancouver, developing concepts for Rogers Arena’s dining attractions and running the popular Center Ice Grill. Born in Rome, Chef Pescetelli developed an interest in the culinary arts at a young age, when he went to work with his father at a Mexican restaurant. While pursuing other passions, such as photography, he continued to be fascinated by food, and in 2004 he became Chef de Partie at Orso, studying under Executive Chef Martin Wilson. Three years later, Chef Pescetelli joined Gordon Ramsay’s Savoy Grill, where he studied the art and presentation of French Cuisine as the Michelin-starred restaurant’s Chef de Partie. International travel soon became a lifestyle for Chef Pescetelli. From London, he moved to the United States to take the role of Executive Chef at Canina Toscana in Bradenton, Florida. With a desire to learn more about European and Asian cuisine, he moved back to Rome and became Executive Sous Chef at Dulcamara, while also launching his own fine artistic pastry brand, Dulamelie. In 2011, he opened the business in Peru, and simotaneously launched Raymi Restaurant and Grill as its Executive Chef. Having settled in Vancouver, Chef Pescetelli is working on his next achievement, “The Modernist Gourmet Bible.” He describes it as a “sophisticated ‘Liquid Proof’ culinary guide” for chefs, accumulating all of the knowledge he has gained throughout his career. Chef Pescetelli earned his French Pastry Course certification at Le Cordon Bleu Paris in 2012. He is also a proud volunteer, having served with First United Church Community Ministry Society, Pacific Assistance Dogs Society, and Florida Department of Children and Families. Kitchen quirks – do you have any ? Yes. When a new dish creation comes up I have to make everyone taste it, and share my passion on how it was made.